Celiac Sprue is a widely prevalent immune disease of the small intestine induced by dietary gluten intake in genetically susceptible individuals. It has been suggested that prolyl endopeptidases (PEPs) may be useful catalysts for gluten detoxification. We have investigated this hypothesis using food-grade gluten as the target antigen, and a combination of mass spectrometry and patient-derived T cells as quantitative assay systems. Spectrometric characterization of physiologically proteolyzed gluten revealed a number of 10 to 50 residue peptides containing known T cell epitopes involved in Celiac Sprue pathogenesis. Several of these peptides were multivalent, suggesting they may be potent triggers of the inflammatory response to gluten in celiac patients. Treatment of proteolyzed gluten with recombinant bacterial PEP decreased the number of potentially immunostimulatory peptides. Substantially reduced immunogenicity was also quantified in 12 of 14 intestinal polyclonal T cell lines from celiac patients. Kinetic investigations using eight T cell clones showed rapid destruction of α-gliadin epitopes, but less complete processing of γ-gliadin epitopes. Given the difficulty associated with a strict lifelong gluten-exclusion diet, the ability of a single enzyme to greatly reduce the antigenic burden of grocery store gluten reinforces the case for developing oral peptidase therapy against Celiac Sprue. Celiac Sprue, also known as celiac disease, is a multifactorial disorder that affects children and adults with high prevalence (1:100–1:300) (Mäki et al., 2003). The disease is characterized by an inflammatory response to ingested wheat gluten (and the similar proteins in rye and barley), which leads to destruction of the intestinal villi and impairs ability to absorb nutrients (Farrell and Kelly, 2002; Sollid, 2002; Green and Jabri, 2003). The disease may present in early childhood with malabsorption, diarrhea, and failure to thrive, but often manifests later in life with predominant extraintestinal symptoms such as fatigue, osteoporosis, anemia, psychiatric syndromes, and neurological conditions (Farrell and Kelly, 2002; Green and Jabri, 2003). Among complex immune disorders, Celiac Sprue is unique in that critical factors that contribute to its etiology have been identified. Gluten proteins are obligate environmental triggers, whereas human leukocyte antigen (HLA) genes (DQ2 and DQ8) are a primary genetic factor (Sollid, 2002). Several studies have mapped epitopes in gluten that stimulate intestinal CD4+ T cells from Celiac Sprue patients but not control subjects. These T cells are invariably restricted HLA-DQ2 or -DQ8 (Sollid, 2002). They focus on Gln- and Pro-rich peptides that are deamidated by tissue transglutaminase (TG2) (Molberg et al., 1998; van de Wal et al., 1998; Arentz-Hansen et al., 2000, 2002; Vader et al., 2002), an enzyme that is also the target of disease-specific autoantibodies (Dieterich et al., 1997). T cell epitopes have been identified in both the major classes of gluten proteins, the monomeric gliadins and the polymeric glutenins, but it is clear that a hierarchy exists between different epitopes. In particular, the α-gliadin epitopes are recognized by T cells from almost all patients, whereas responses to the γ-gliadin and glutenin epitopes are less frequent in intestinal T cell lines derived from patients (Sjöstrom et al., 1998; Arentz-Hansen et al., 2000, 2002; Shan et al., 2002; Vader et al., 2002, 2003). T cell epitopes are unevenly distributed in the sequences of gliadin proteins; they cluster in Pro- and Gln-rich regions (Arentz-Hansen et al., 2000), which are also more resistant to gastrointestinal digestion (Hausch et al., 2002; Shan et al., 2002). For example, a 33-mer fragment of an α-gliadin, LQLQPFPQPQLPYPQPQLPYPQPQLPYPQPQPF (αG-33), which is naturally formed by digestion with gastric and pancreatic enzymes and which is resistant to further degradation by brush-border enzymes, contains six partly overlapping copies of three different T cell epitopes (DQ2-α-I, DQ2-α-II, and DQ2-α-III). It is an excellent substrate for TG2 and is recognized by intestinal T cell lines from all Celiac Sprue patients much more effectively than shorter peptides covering single epitopes (Shan et al., 2002). Prolyl endopeptidases (PEPs) are ubiquitous proteases in biological systems. Although these enzymes are expressed in several mammalian tissues, their absence from pancreatic proteases or the intestinal brush-border membrane highlights the lack of a role for PEP activity in the assimilation of dietary proteins in mammals. We have recently shown that selected Pro-rich immunogenic gliadin peptides, including αG-33, can be rapidly cleaved by a bacterial PEP, especially in conjunction with the enzymes of the intestinal brush-border membrane (Hausch et al., 2002; Shan et al., 2002; Piper et al., 2004). This suggests a potential approach for detoxifying gluten ingested by a Celiac Sprue patient. To be therapeutically useful, PEP must be capable of detoxifying whole gluten, not just selected epitopes. Food-grade gluten is an extremely complex protein mixture that consists of hundreds of distinct (but related) gliadin and glutenin polypeptides. Approximately 60% of the gliadin proteins are α-gliadins, 30% are γ-gliadins, and 10% are ω-gliadins (Wieser et al., 1994). Here, we demonstrate that PEP, in combination with gastric and pancreatic enzymes as well as brush-border membrane enzymes, is able to reduce the immune response of patient-derived intestinal T cells to less than 2% of the response induced by positive controls in most cases. In addition, liquid chromatography-tandem mass spectrometry (LC-MS/MS) analysis supports and partially explains these results at a chemical level. Materials. All enzymes were purchased from Sigma-Aldrich (St. Louis, MO) except for Pepsin, which was obtained from American Laboratories (Omaha, NE) and trypsin + chymotrypsin, which was purchased from Enzyme Development Co. (New York, NY). The specific activities of all enzymes were tested using standard chromogenic assays before use and were found to be pepsin, 4000 U/mg; trypsin, 2000 USP/mg; chymotrypsin, 800 USP/mg; elastase, 5 U/mg; and carboxypeptidase A, 30 U/mg. Wheat gluten flour was from Bob's Red Mill (Milwaukee, WI). All other reagents were food or reagent grade. Substrates for the chromogenic assays were purchased from Sigma-Aldrich except for Z-Glu-Pro-p-nitroanilide, which was purchased from Bachem (Basel, Switzerland). Enzyme Activity Assays. Activity assay protocols for pepsin, trypsin, chymotrypsin, elastase, carboxypeptidase A, PEP, as well as dipeptidyl peptidase IV (DPP IV) and aminopeptidase N (APN) from the rat brush-border membrane (BBM) are described in detail in the Supplementary Materials. Isolation of Rat Brush-Border Membrane. Sprague-Dawley rats were anesthetized with ketamine and 25 cm of the jejunum was removed; each rat was then killed by exposure to CO2 and subsequent cervical dislocation. The jejunum was flushed gently with 0.9% NaCl, 1 mM dithiothreitol and cut longitudinally, and the mucosa was scraped off with glass microscopic slides. The recovered tissue was homogenized in a Dounce homogenizer in 5 mM EDTA and 5 mM histidine-imidazole, pH 7.4, and centrifuged at 55,000g for 20 min at 4°C. Fifteen ml of 0.25 M sorbitol, 12.5 mM NaCl, 0.5 mM EDTA, and 5 mM histidine-imidazole, pH 7.4, was added to the pellet, which was then homogenized again, diluted to 25 ml, and centrifuged at 1400g for 10 min at 4°C. Five milliliters of 50 mM mannitol in 2 mM Tris-HCl, pH 7.1, was added to the pellet, and the solid was homogenized in a Polytron homogenizer at setting 3 for three 30-s periods. The homogenate was then diluted to 10 ml, and CaCl2 was added to a final concentration of 10 mM. The suspension was stirred for 30 min at 4°C and subsequently centrifuged at 2000g for 10 min at 4°C. The supernatant was collected and centrifuged for 20 min at 20,000g at 4°C. The resulting pellet was resuspended in PBS, pH 7.1. Activity of the preparation was confirmed by analysis of APN and DPP IV activities to be 10- to 15-fold purified over the initial tissue homogenate. Gluten Treatment with Gastric and Pancreatic Enzymes. Wheat gluten flour (3.0 g) was added to 100 ml of water with addition of HCl to achieve a stable suspension at pH 2.0. Pepsin (Pepsin NF powder, 1:10,000, 60 mg) was mixed in to the gluten suspension and the gluten-pepsin mixture was shaken constantly at 37°C for 2 h. After the pepsin treatment had been completed, 350 mg of Na2HPO4 was added, and the pH was adjusted to 7.9 by addition of 0.1 M NaOH. A mixture of trypsin/chymotrypsin (38 mg) was added and the mixture was shaken again at 37°C for 2 h and then heated to >95°C for 10 min. After cooling to room temperature, 74 μl of the mixture was treated with elastase (20 μl, 1 mg/ml), and the mixture was diluted to 1.7 mg/ml using PBS buffer, pH 7.5. The mixture was maintained at 37°C. After 2 h the digested gluten suspension was heated to 95°C for 10 min and cooled to room temperature. Carboxypeptidase A (20 μl) was added and incubated at 37°C for 2 h and subsequently heat deactivated at 95°C for 15 min. PEP and BBM Treatment. Recombinant PEP (specific activity ∼40 U/mg), prepared as described previously (Shan et al., 2004), was added at a ratio of 200 mU/mg of the pepsin, trypsin, chymotrypsin-digested gluten substrate, incubated at 37°C for 15 min to 1 h, and then heat deactivated, depending on the sample. Subsequently BBM [65 mU (DPP IV activity)/mg substrate] was added and the mixture was incubated for 1 h and heat deactivated at 95°C for 15 min. Control samples contained PEP and BBM buffer solutions without the enzymes. Reverse Phase-High-Performance Liquid Chromatography (RP-HPLC). 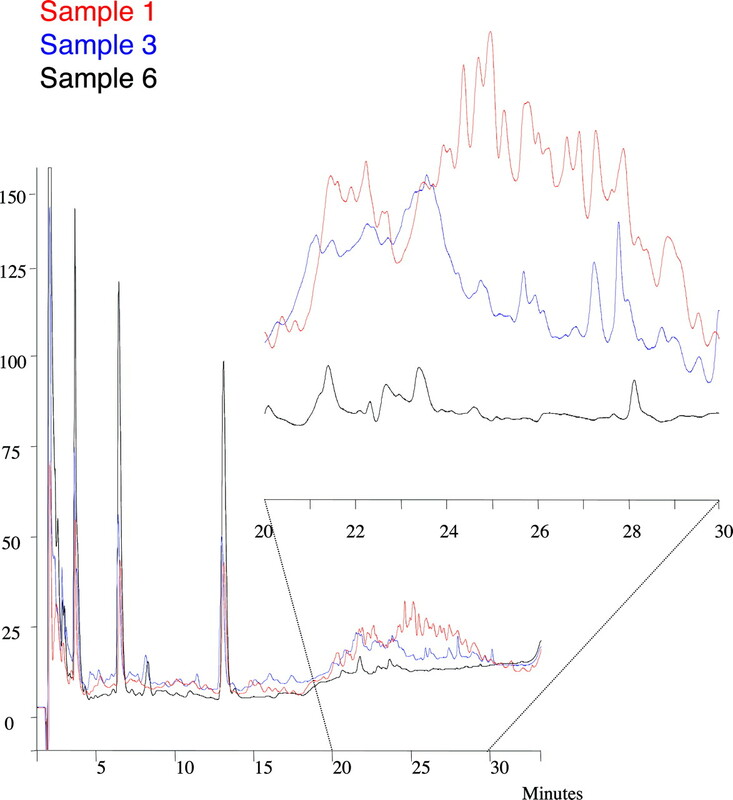 Samples were chromatographically separated on a 4.6 × 150-mm reverse phase C18 protein and peptide column (Vydac, Hesperia, CA) using Rainin Dynamax SD-200 pumps (1 ml/min), a Varian 340 UV detector set at 215 nm, and a Varian Prostar 430 autosampler. Solvent A was H2O with 0.1% trifluoroacetic acid (TFA) and solvent B was acetonitrile with 0.1% TFA. Samples were centrifuged for 10 min at 13,400 × g, prior to injection. HPLC-MS. Separations were performed on a Surveyor HPLC system (Thermo Finnigan, San Jose). Solvent A was H2O with 0.1% formic acid and 0.025% TFA; solvent B was acetonitrile with 0.085% formic acid and 0.022% TFA. Samples were chromatographed on a Vydac 2.0 × 150-mm reverse phase C18 column at a flow rate of 200 μl/min, using a gradient of 5 to 35% B over 30 min. The column was connected directly to the LCQ quadrupole ion trap mass spectrometer equipped with an electrospray ion source operating in positive ion mode. The sheath gas was set to 60 (arbitrary units), spray voltage to 4.5 kV and capillary temperature to 200°C. The system acquires full MS, zoom scan, and MS/MS spectra in an automatic data dependent mode. Data were processed with the Sequest Browser software. Detected ions and fragments were searched against all sequences in the Entrez Protein database of the National Center for Biotechnology Information that responded to the search term “Triticum” (>2000 protein sequences). Sequences with a cross correlation value below 1.5 were rejected; the remaining sequences were searched for epitope sequences listed in Supplementary Materials (Table S1). T Cell Assays. The generation of polyclonal gluten-specific T cell lines derived from ex vivo gluten-challenged small intestinal biopsy specimens of adult Celiac Sprue patients have been described elsewhere (Arentz-Hansen et al., 2002). For this study, 14 different intestinal T cell lines derived from 13 DQ2+ celiac patients were selected based on two criteria: 1) effective recognition of TG2-treated digests of gluten, and 2) significant responses to at least two different gluten epitopes (Supplementary Materials, Table S2). The generation of intestinal T cell clones and the epitope specificity of these clones, except TCC 387.3, has been described previously (Arentz-Hansen et al., 2000). The TCC 387.3 recognizes a TG2-dependent epitope, defined as γ-VI that is contained within residues 62 to 72 (PQQPFPQQPQQ) of recombinant γ-5 gliadin (Ø. Molberg, unpublished data). The freeze-dried, proteolyzed gluten samples were dissolved in PBS with 2 mM CaCl2 and treated with 150 μg/ml human recombinant TG2 (Piper et al., 2002), or in some experiments 200 μg/ml guinea pig transglutaminase (Sigma-Aldrich), for 2 h at 37°C. The TG2-treated samples were incubated overnight in triplicates on U-bottomed 96-well plates with 75,000 cells/well of DQ2 homozygous, irradiated (75-Gy) Epstein-Barr virus-transformed B-lymphoblastoid cell lines in a volume of 100 μl of 15% pooled, inactivated human serum and RPMI 1640 medium. After the incubation, 50 μlof freshly thawed T cells (1 × 106 cells/ml) was added to each well. The proliferation in the wells was evaluated by [3H]thymidine incorporation from 48 to 72 h after the addition of the T cells. Wheat gluten was proteolyzed with pepsin, followed by pancreatic proteases (trypsin, chymotrypsin, elastase, and carboxypeptidase A), followed by PEP (or vehicle), and eventually BBM (or vehicle). The overall proteolytic protocols are as detailed under Materials and Methods and summarized Fig. 1. Samples 1 to 7 were prepared as described in Table 1. Sample 1, the reference PTCEC-gluten sample, was not exposed to BBM or PEP. Samples 2 and 3 were exposed to PEP for increasing durations, without subsequent exposure to BBM. Sample 4 was exposed to BBM but not PEP. Samples 5 and 6 were exposed to both PEP (for increasing durations) and BBM. Sample 7, which was quenched immediately after adding PEP and BBM, was included as a control to verify the lack of effect of either PEP or BBM components on mass spectrometric or T cell assays. Overall strategy for simulating enzymatic detoxification of gluten. In a step designed to mimic the action of the stomach on dietary gluten, commercial gluten was first treated with pepsin under acidic conditions. The reaction mixture was neutralized and treated with trypsin, chymotrypsin, elastase, and carboxypeptidase to simulate the effect of pancreatic secretions on dietary gluten emptied into the duodenum from the stomach. The resulting material, which is known to be toxic for Celiac Sprue patients, was optionally treated with PEP and/or BBM. Rat BBM preparations contain membrane bound exopeptidases; their in vitro activity mimics the intact digestive surface in the small intestine. The gluten samples 1 to 7 were initially analyzed using RP-HPLC (Fig. 2). Due to the complexity of the mixtures analyzed, individual peaks could not be readily identified; most of the observed peaks (including the major peaks in the 3–13-min range) are likely to represent mixtures of peptides. As expected, the HPLC traces of the samples 1 (blue) and 7 (data not shown) showed no qualitative difference. Both samples revealed a complex mixture of peaks in the 20- to 30-min range. Most known immunogenic peptides, such as PQPQLPYPQPQLP (which elutes at ca. 20 min) and the 33-mer LQLQPFPQPQLPYPQPQLPYPQPQLPYPQPQPF (which elutes at ca. 30 min), elute within this range under similar conditions. Treatment of samples with PEP only (e.g., sample 3) resulted in attenuation of the 20- to 30-min envelope, especially the late-eluting peptide peaks (>23 min), which included several long, multivalent peptides (vide infra; see also Tables S3–S5 in Supplementary Materials). Thus, PEP treatment of PTCEC gluten seemed to result in a substantial reduction in the median peptide length. Treatment with BBM and PEP (e.g., sample 6) led to almost complete decomposition of all peaks eluting after 15 min, with a concomitantly strong increase of peaks eluting at 3, 7, and 13 min. This is consistent with the known ability of BBM exopeptidases to efficiently recognize the short peptidic products generated by PEP action (Hausch et al., 2002). UV215 traces of PEP- and BBM-treated PTCEC gluten. Samples 1, 3, and 6 are as described in Table 1. The inset shows an expanded view of the chromatogram in the 20- to 30-min region, where most immunogenic gluten peptides elute. Overall Analysis. The number of distinct peptides with lengths between 4 and 55 amino acids in each gluten sample varied between 133 (sample 6) and 314 (sample 7) (Figure S1, Supplementary Materials). Overall, 1549 sequences with a cross-correlation >1.5 were identified, including duplicates. When the cross-correlation, which serves as a measure for the reliability of an identified sequence, was lowered to 1.0, the number of distinct peptides increased from 314 to 444 in sample 7 (treated only with PTCEC). If the cross-correlation was increased to 2.0, the number decreased from 314 to 162 for the same sample. Length Distribution of Identified Sequences xC = 1.5. The average length of the 1549 identified sequences identified in samples 1 to 7 was 20.3 residues. No clear trend could be deduced from the data; the minimum average length was 17.3 residues (sample 2), whereas the maximum average length was 26.0 residues (sample 7). Abundance of Epitope-Containing Peptides. The amino acid sequences of the proteolytic fragments identified in samples 1 to 7 were screened for core DQ2-binding epitopes (nine residues) corresponding to the majority of (DQ2-restricted) T cell stimulatory gluten peptides identified to date (Supplementary Materials, Table S1). In total, 68 distinct epitope-containing peptides were identified (Table 2 and Supplementary Materials, Tables S3–S5). Except for the γ-VI epitope, nearly all of the epitope-containing peptides were present in non-PEP-treated samples. The percentage of the epitope-bearing peptides in each sample is shown in Supplementary Materials (Figure S1). As can be seen, there is a pronounced reduction in the prevalence of epitope-bearing peptides in samples treated with PEP (samples 2, 3, 5, and 6). Notably, BBM treatment without PEP of the PTCEC-gluten led to only a modest reduction in epitope-containing peptides (Table 2 and Supplementary Materials, Figure S1). The sequences of these peptides are given in Supplemental Table 1. Origins and Sequences of Epitope-Containing Peptides. The origins of the 68 epitope-containing peptides in samples 1 to 7 are summarized in Table 2, and their individual sequences are detailed in Supplementary Materials (Tables S3–S5). Notably, although a majority of gluten proteins in the Entrez database include γ-gliadin and glutenin sequences rather than those of α- or ω-gliadins, α-gliadin peptides comprise 32% of all identified epitope-bearing peptides. α-Gliadin Epitopes. Whereas each of the three known α-gliadin epitopes (α-I, α-II, and α-III) were found in untreated and BBM-treated gluten (samples 1 and 4; sample 7 revealed α-I and α-II, but not α-III, epitopes), PEP treatment (samples 2, 3, 5, and 6) led to the elimination of all α-gliadin epitope-bearing peptides (Table 2). All α-gliadin epitopes were found to occur in two closely related families of gluten peptides (Supplementary Materials, Table S3; entries 1 and 2 and entries 4–6); the first of these families is closely related to the previously identified 33-mer αG-33 (Shan et al., 2002). γ-Gliadin Epitopes. Although the γ-VI epitope was identified in all samples except in sample 6, there were fewer γ-VI epitope-bearing peptides in the PEP-treated samples (Table 2 and Supplementary Materials, Table S4). Thus, this epitope seems to be somewhat resistant to cleavage by the Flavobacterium meningosepticum PEP. The 9-mer core region of this epitope was identified in at least nine different gluten peptides. This is likely a major factor contributing to the many hits observed for this epitope. The γ-II epitope was found in samples 1 and 7, and Glia-γ2 was found in sample 1 (Table 2 and Supplementary Materials, Table S4). Other Epitopes. Epitope Glt-17 was found in samples 1, 3, and 7 and occurs in the context of multiple peptides (Table 2 and Supplementary Materials, Table S5). T cell assays were performed on 14 polyclonal cell lines derived from small intestinal biopsies of Celiac Sprue patients as well as eight intestinal T cell clones that recognize distinct epitopes. These gluten-responsive, HLA-DQ2-restricted T cells are a hallmark of Celiac Sprue, notably, they are not found in the intestinal mucosa of control individuals, regardless of their HLA background (Molberg et al., 1997). As was expected from previous experience (Arentz-Hansen, 2000, 2002), all T cell lines displayed vigorous gluten dose-dependent increases in [3H]thymidine incorporation, reflecting T cell replication in the presence of TG2-treated gluten (sample 1) and DQ2+ antigen presenting cells (Figs. 3 and 4). All samples were pretreated with TG2 and tested at four different dilutions. From previous studies, we determined that 250 μg/ml TG2-treated gluten is sufficient to obtain near maximal T cell proliferation; therefore, this ratio was thus chosen as the highest test concentration for all samples. 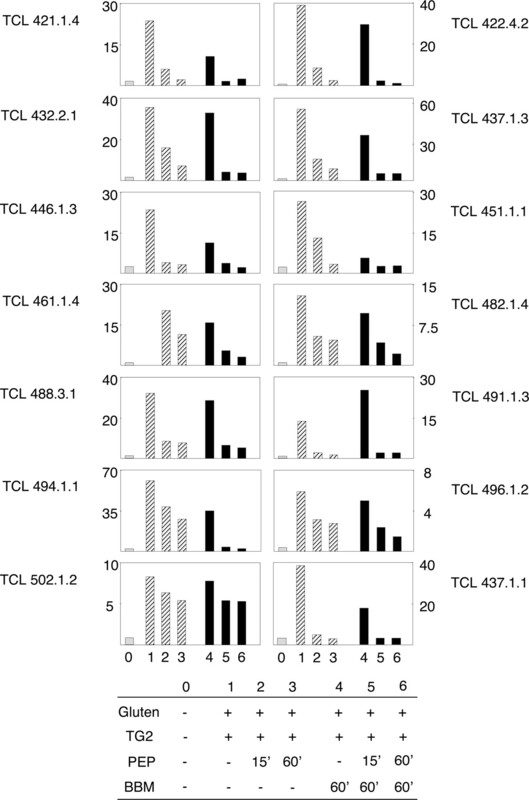 Figure 3 shows the responses of 14 polyclonal T cell lines to 250 μg/ml of alternatively prepared gluten samples. BBM treatment alone can attenuate the T cell response somewhat (sample 4 versus sample 1), as illustrated by the T cell lines TCL 421.1.4 and 451.1.1. However, this effect is modest compared with the dramatic decline in T cell response seen after 15 min, and especially 60 min of PEP treatment (samples 2 and 3). Notably, in many cases the combined effects of BBM and PEP seem to be highly complementary. Figure 4 shows the dose dependence of responses to samples 1 to 6 in six of the T cell lines. A similar picture was obtained with the remaining eight T cell lines. Response of 14 T cell lines challenged with 250 μg/ml gluten. The conditions under which individual gluten samples were treated are summarized in the table below. Sample 1 data for TCL 461.4 was lost and has therefore not been plotted. 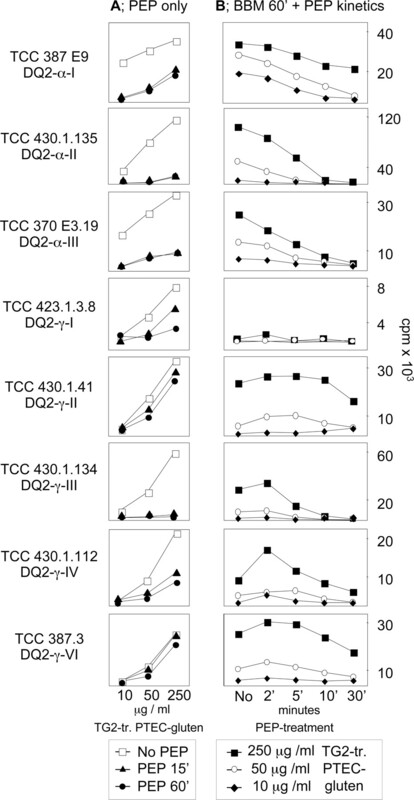 Response of six polyclonal T cell lines to varying concentrations of individual TG2-treated PTCEC-gluten samples. To quantify the effects of PEP and BBM treatment of gluten on its ability to induce proliferation of different T cell lines, the proliferative responses to samples 3 (PEP alone), 4 (BBM alone), and 6 (PEP + BBM) were calculated as a percentage of proliferation observed with sample 1 (no PEP or BBM) (Supplementary Materials, Table S6). Based on this analysis, PEP treatment alone completely detoxifies gluten from the viewpoint of a majority of the celiac lesion derived T cell lines (eight of 14); the same PEP-treated gluten can be considered partially detoxified as assessed by the remaining T cell lines. No case was identified where the antigenicity of gluten was unaffected by PEP treatment. The complementary effect of BBM is also apparent, since 12 of 14 T cell lines indicated a complete destruction of T cell epitopes when treated with PEP and BBM in sequence; the remaining two T cell lines showed some residual activity of the PEP and BBM-treated gluten. In contrast, BBM treatment alone led to complete abrogation of T cell response for only one line (TCL 451.1.1) and partial abrogation of T cell responses in only six lines. The responses of the remaining lines were unaltered by BBM treatment of gluten. Together, these results make a compelling case for the potential benefit of PEP in the digestive system of the Celiac Sprue patient. Since individual T cell clones recognize distinct epitopes from gluten, they provide an excellent assay system to quantify the abundance of that epitope in a complex but physiologically relevant material such as proteolyzed gluten. Eight celiac lesion-derived T cell clones were characterized using the same assay setup as in the case of polyclonal T cell lines (Fig. 5A). The kinetics of destruction of gluten epitopes were also monitored by exposing gluten to PEP for varying time periods while keeping the BBM exposure constant (Fig. 5B). A pattern emerges from this data set. The α-gliadin epitopes are highly susceptible to PEP-mediated destruction, the α-II and α-III more so than the α-I. PEP-treated gluten retains some activity for the α-I-specific intestinal T cell clone 387E9 even after 60-min PEP treatment, whereas the peptides recognized by the α-II specific T cell clone 430.1.135 and the α-III specific 370E3.19 are almost completely destroyed at the earliest time point (Fig. 5, A and B). This is consistent with the notion that the immunodominant α-G 33 peptide is destroyed by PEP (Shan et al., 2002). Response of T cell clones to gluten. A, titration with increasing concentrations of gluten. B, kinetics of gluten destruction upon treatment with PEP (all samples treated with BBM for 60 min). In contrast, destruction of some γ-gliadin epitopes is considerably less efficient by the F. meningosepticum PEP. Indeed, BBM treatment alone has a dramatic effect on the γ-I and IV epitopes (TCC 423.1.3.8 and TCC 430.1.112), but only a partial effect on the γ-II, γ-III, and γ-VI epitopes (TCC 430.1.41, 430.1.134, and 387.3) (Fig. 5B). Whereas the γ-III epitope is rapidly eliminated by this PEP after only 10 min, gluten fragments containing the γ-II and γ-VI epitopes persist for longer durations. Strict adherence to a gluten exclusion diet is currently the only treatment for Celiac Sprue patients. Compliance is difficult but critical, because untreated disease causes morbidity and is associated with increased mortality (Farrell and Kelly, 2002; Green and Jabri, 2003). Alternative therapeutic options that could ameliorate the burden of dietary restriction are thus in demand. Based upon studies with a recombinant gliadin protein, we recently proposed that a PEP could be an effective catalyst for destruction of proline-rich T cell epitopes (Shan et al., 2002). Here, we have taken a significant step forward through the detailed chemical and biological analysis of the effects of PEP on whole gluten as found in a typical grocery store. Gluten was proteolyzed by pepsin and the pancreatic proteases under physiological conditions to yield a complex mixture of thousands of peptides of varying lengths. Our chemical analyses involved high-resolution chromatographic and mass spectroscopic procedures, whereas our biological analyses involved the use of DQ2-restricted, gluten-responsive T cells from 14 Celiac Sprue patients. In addition to lending further support to the proposal that immunogenic fragments of gluten are also proteolytically resistant, our results demonstrate that a suitable PEP, or a mixture of PEPs with complementary substrate specificities, may be an effective way to render gluten harmless for many Celiac Sprue patients. LC-MS/MS of whole gluten proteolyzed under various conditions demonstrated that a large fraction of epitope-containing peptides were between 21 and 30 residues in length (31 of 68, 46%), although a few peptides (10 of 68, 15%) were longer than 30 residues, and 27 of 68 (40%) were between 11 and 20 residues in length. In contrast, the distribution of nonantigenic peptides was biased toward shorter lengths: 1–10 residues, 38%; 11–20 residues, 27%; 21–30 residues, 22%; and >30 residues, 14%. There may be an overall bias in the length assessment, because reliable detection of long peptide sequences using ion trap MS/MS detection is limited due to incomplete fragmentation of longer peptides. The problem is exacerbated for peptides rich in Pro and Gln residues, because they inhibit complete fragmentation. Finally, our LC-MS/MS based assessment of the residual immunotoxicity of individual gluten samples may be affected by other biasing factors. For example, the multiple hits for the γ-VI epitope are likely due to the large number of parent sequences harboring this epitope in the Entrez Protein database; they may not necessarily imply an exceptionally high abundance of this sequence. Also, quantification of peptide abundance by MS requires the use of internal standards (Gygi et al., 1999; Turecek, 2002), which are difficult to generate for complex, uncharacterized, and variable materials such as grocery store gluten. Notwithstanding these limitations, we have used LC-MS/MS to demonstrate that PEP treatment and, to a lesser extent, BBM treatment, results in a substantial reduction of abundance of immunogenic peptides in gluten that has been pretreated with pepsin and pancreatic enzymes. T cells derived from small intestinal biopsy samples of Celiac Sprue patients are exquisitely sensitive and accurate monitors of the inflammatory potential of a processed gluten sample. In the absence of an animal model for Celiac Sprue, such T cell proliferation assays are the best approximation for quantifying the toxic effects of gluten in Celiac Sprue patients. Although intact small intestinal biopsies from celiac patients have been used to demonstrate gluten toxicity ex vivo (Maiuri et al., 2003), their scarcity and sample-to-sample variability makes them unsuitable for quantitative pharmacological evaluation of experimental therapeutic agents. Both monoclonal and polyclonal T cell samples have been used in this study to evaluate the scope of PEP therapy for Celiac Sprue. In many cases, PEP alone is enough to achieve complete detoxification of gluten predigested by pepsin and the pancreatic enzymes without the need for exposure to BBM, whereas in some cases, although PEP treatment results in partial processing of gluten, the action of BBM peptidases is necessary to achieve complete detoxification. These findings reinforce the heterogeneity of disease-associated T cells among Celiac Sprue patients, which in turn may forebode the heterogeneity of patient response to a selected PEP such as the F. meningosepticum enzyme. For example, to the extent that the observed T cell responses in Figs. 3 and 4 accurately reflect in vivo conditions, one might predict (Supplementary Materials, Table S6) that patients 421, 422, 432, 437, 446, 451, and 491 would respond well to PEP treatment. Additionally, patients 461, 482, 488, 494, and 496 may also derive some benefit from PEP treatment, although complete benefit would require optimal small intestinal mucosal structure to yield active BBM peptidases. In contrast, patient 502 is unlikely to stay in remission when challenged with gluten even when treated with an otherwise effective PEP. From the known reactivity pattern of this T cell line (Supplementary Materials, Table S2), one might have predicted that it should be sensitive to PEP. The unexpected finding brings up the possibility that some of the T cells within the line respond to an unidentified gluten peptide that is only infrequently recognized by T cells but is resistant to treatment with PEP and BBM. Ultimate verification of such hypotheses will require controlled in vivo and ex vivo clinical studies with PEP in Celiac Sprue patients. In addition to polyclonal T cell lines, monoclonal T cells are also valuable reagents for evaluating the efficacy of PEP (Fig. 5). In particular, since their epitope specificity has been precisely characterized, they serve as excellent reporters of the persistence of individual epitopes in a complex gluten mixture that has been treated with a given PEP. For example, from analysis of eight different T cell clones, it can be concluded that, whereas the F. meningosepticum enzyme has high specificity for α-gliadin epitopes, it has lower specificity for γ-gliadin epitopes. Epitopes γ-II (TG2-treated IQPQQPAQL) and γ-VI (TG2-treated PQQPF-PQQPQQ) recognized by the intestinal T cell clones 430.1.41 and 387.3, respectively, seem to be stable against treatment with both PEP and BBM. It should be noted, however, that these two epitopes, despite their resistance to the PEP and BBM treatment, are not frequently recognized by intestinal T cell lines (Supplementary Materials, Table S2; Shan et al., 2002). This could be related to low levels of proteins containing these epitopes in ingested gluten, inefficient presentation by DQ2+ antigen-presenting cells in the celiac lesions, and/or lack of T cells with appropriate T cell receptors. Encouragingly, parallel studies have revealed that PEPs from different sources have different substrate specificities, both with regard to cleavage sites and substrate chain lengths (Shan et al., 2004). Thus, there remains considerable potential for combining PEPs with complementary substrate specificities, or for screening and/or engineering PEPs with optimized ability to render gluten nonstimulatory to intestinal T cells in Celiac Sprue patients. In summary, this study has substantially strengthened our earlier proposal that enzymatic detoxification of gluten has the potential to be an effective method for treating Celiac Sprue. It should be noted that although the pivotal role of gluten responsive CD4+ T cells in Celiac Sprue pathogenesis is well established, alternative mechanisms for the initiation of the celiac lesion in the small intestine have been proposed (Tuckova et al., 2002; Maiuri et al., 2003). The precise structural basis for gluten toxicity via these mechanisms remains to be elucidated; consequently, the ability of PEP to cleave the corresponding peptides in grocery store gluten cannot be systematically evaluated at present. However, in those cases where specific gluten peptides have been proposed as pathogenic triggers the intestinal brush-border membrane peptidases can efficiently cleave these peptides either alone or in conjunction with PEP (Piper et al., 2004). Ultimate verification of the therapeutic utility of PEP will of course require patient trials, which might initially consist of exposing celiac volunteers to PEP-treated and untreated gluten. HPLC-MS analysis was performed at the Vincent Coates Laboratory for Mass Spectrometry at Stanford University. We thank Dr. Allis Chien and coworkers for sample processing as well as for helpful discussions. This work was supported by charitable donations to the nonprofit Celiac Sprue Research Foundation, and by grants from the Research Council of Norway, the University of Oslo, and Rikshospitalet University Hospital. T.M. was supported in part by the Maribeth Evelyn Lynn Fellowship. ABBREVIATIONS: HLA, human leukocyte antigen; LC-MS/MS, liquid chromatography-tandem mass spectrometry; PEP, prolyl endopeptidase; DPP IV, dipeptidyl peptidase IV; APN, aminopeptidase N; BBM, brush-border membrane; PBS, phosphate-buffered saline; RP-HPLC, reverse phase-high-performance liquid chromatography; TFA, trifluoroacetic acid; PTCEC, pepsin, trypsin, chymotrypsin, elastase, carboxypeptidase. ↵1 These authors contributed equally to this manuscript. Arentz-Hansen H, Körner R, Molberg Ø, Quarsten H, Vader W, Kooy YM, Lundin KEA, Koning F, Roepstorff P, Sollid LM, et al. (2000) The intestinal T cell response to alpha-gliadin in adult celiac disease is focused on a single deamidated glutamine targeted by tissue transglutaminase. J Exp Med 191: 603–612. Arentz-Hansen H, McAdam SN, Molberg Ø, Fleckenstein B, Lundin KEA, Jørgensen TJD, Jung G, Roepstorff P, and Sollid LM (2002) Celiac lesion T cells recognize epitopes that cluster in regions of gliadins rich in proline residues. Gastroenterology 123: 803–809. Dieterich W, Ehnis T, Bauer M, Donner P, Volta U, Riecken EO, and Schuppan D (1997) Identification of tissue transglutaminase as the autoantigen of celiac disease. Nature (Lond) Med 3: 797–801. Farrell RJ and Kelly CP (2002) Celiac sprue. New Engl J Med 346: 180–188. Green PHC and Jabri B (2003) Coeliac disease. Lancet 362: 383–391. Gygi SP, Rist B, Gerber SA, Turecek F, Gelb MH, and Aebersold R (1999) Quantitative analysis of complex protein mixtures using isotope-coded affinity tags. Nat Biotechnol 17: 994–999. Hausch F, Shan L, Santiago NA, Gray GM, and Khosla C (2002) Intestinal digestive resistance of immunodominant gliadin peptides. Am J Physiol 283: G996–G1003. Maiuri L, Ciacci C, Ricciardelli I, Vacca L, Raia V, Auricchio S, Picard J, Osman M, Quaratino S, and Londei M (2003) Association between innate response to gliadin and activation of pathogenic T cells in coeliac disease. Lancet 362: 30–37. Mäki M, Mustalahti K, Kokkonen J, Kulmala P, Haapalahti M, Karttunen T, Ilonen J, Laurila K, Dahlbom I, Hansson T, et al. (2003) Prevalence of Celiac disease among children in Finland. N Engl J Med 348: 2517–2524. Molberg Ø, Kett K, Scott H, Thorsby E, Sollid LM, and Lundin KEA (1997) Gliadin specific, HLA DQ2-restricted T cells are commonly found in small intestinal biopsies from coeliac disease patients, but not from controls. Scand J Immunol 46: 103–108. Molberg Ø, McAdam SN, Körner R, Quarsten H, Kristiansen C, Madsen L, Fugger L, Scott H, Noren O, Roepstorff P, et al. (1998) Tissue transglutaminase selectively modifies gliadin peptides that are recognized by gut-derived T cells in celiac disease. Nat Med 4: 713–717. Piper JL, Gray GM, and Khosla C (2002) High selectivity of human tissue transglutaminase for immunoactive gliadin peptides: implications for celiac sprue. Biochemistry 41: 386–393. Piper JL, Gray GM, and Khosla C (2004) Effect of prolyl endopeptidase on digestive-resistant gliadin peptides in vivo. J Pharmacol Exp Ther 311: 213–219. Shan L, Molberg Ø, Parrot I, Hausch F, Filiz F, Gray GM, Sollid LM, and Khosla C (2002) Structural basis for gluten intolerance in celiac sprue. Science (Wash DC) 297: 2275–2279. Shan L, Marti T, Sollid LM, Gray GM, and Khosla C (2004) Comparative biochemical analysis of three bacterial prolyl endopeptidases: implications for Celiac Sprue. Biochem J 383: 311–318. Sjöström H, Lundin KE, Molberg Ø, Körner R, McAdam SN, Anthonsen D, Quarsten H, Noren O, Roepstorff P, Thorsby E, et al. (1998) Identification of a gliadin T-cell epitope in coeliac disease: general importance of gliadin deamidation for intestinal T-cell recognition. Scand J Immunol 48: 111–115. Sollid LM (2002) Coeliac disease: dissecting a complex inflammatory disorder. Nat Rev Immunol 2: 647–655. Tuckova L, Novotna J, Novak P, Flegelova Z, Kveton T, Jelinkova L, Zidek Z, Man P, and Tlaskalova-Hogenova H (2002) Activation of macrophages by gliadin fragments: isolation and characterization of active peptide. J Leukoc Biol 71: 625–631. Turecek F (2002) Mass spectrometry in coupling with affinity capture-release and isotope-coded affinity tags for quantitative protein analysis. J Mass Spectrom 37: 1–14. Vader W, Kooy Y, Van Veelen P, De Ru A, Harris D, Benckhuijsen W, Peña S, Mearin L, Drijfhout JW, and Koning F (2002) The gluten response in children with celiac disease is directed toward multiple gliadin and glutenin peptides. Gastroenterology 122: 1729–1737. Vader W, Stepniak D, Kooy Y, Mearin L, Thompson A, van Rood JJ, Spaenji L, and Koning F (2003) The HLA-DQ2 gene dose effect in celiac disease is directly related to the magnitude and breadth of gluten-specific T cell responses. Proc Natl Acad Sci USA 100: 12390–12395. van de Wal Y, Kooy YM, van Veelen PA, Peña SA, Mearin LM, Molberg Ø, Lundin KEA, Sollid LM, Mutis T, Benckhuijsen WE, et al. (1998) Small intestinal T cells of celiac disease patients recognize a natural pepsin fragment of gliadin. Proc Natl Acad Sci USA 95: 10050–10054. Wieser H, Seilmeier W, and Belitz D (1994) Quantitative determination of gliadin subgroups from different wheat cultivars. J Cereal Sci 19: 149–155.